The world’s only six-story composting toilet system. Human waste is transferred to composters and periodically taken offsite to be used as fertilizer. Aerobic digestion heats material to 190 degrees and converts solid waste to compost. 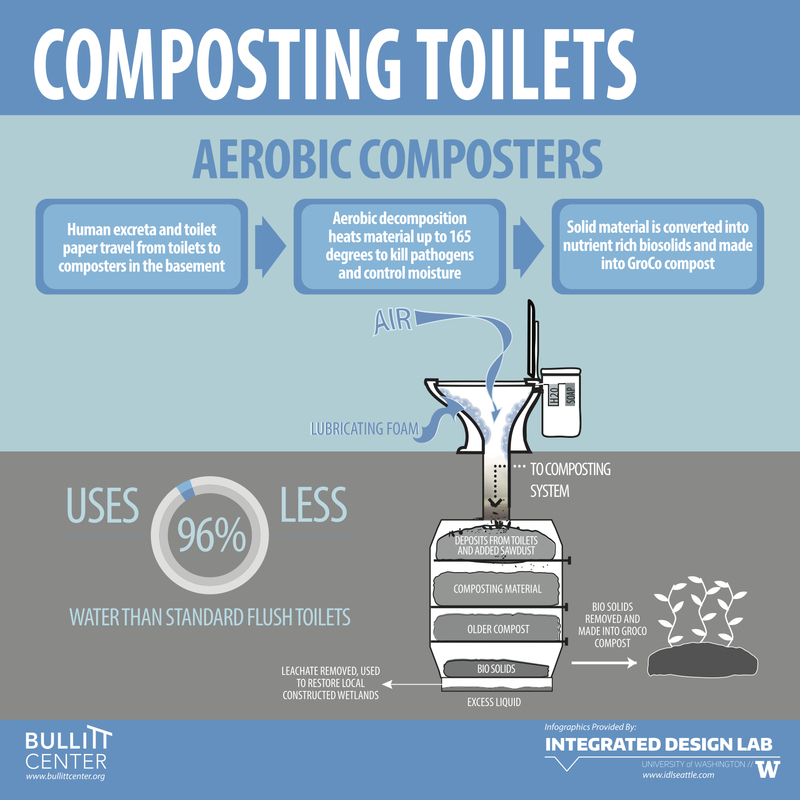 When nature calls at the Bullitt Center, you may be surprised to see waterless toilets. 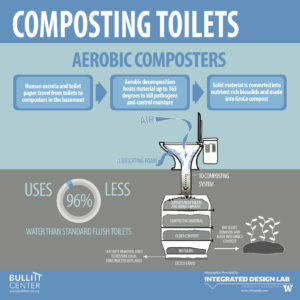 Instead of the normal fish bowl, the toilets at the Bullitt center are a specially designed waterless vessel that feeds into the basement composters through nearly completely vertical pipes. Once the cargo makes it all the way down, it begins a long aerobic process of decomposition in one of ten Phoenix Composting Systems, each about the size of a Volkswagen Beetle (84” tall x 40” wide x 61” deep). The liquid and solid matter is mixed with wood chips and fluffed regularly using tines, or comb-like structures that can be turned using a special socket wrench. As the matter decomposes, the particles become smaller and smaller, and naturally filter down towards the bottom of the pile. Successful compost requires oxygen to keep the pile from going septic, or turning anaerobic. The required air is actually drawn through the toilets themselves then down the waterless pipes. To make sure that oxygen is permeating the pile, the amount of liquid is carefully managed, and spread evenly among the piles. Excess liquid is pumped into leachate storage tanks in an adjacent room. This keeps the decomposition process strictly aerobic, eliminating the release of methane gas and dangerous odors, byproducts of typical waste treatment. In fact, the composters yield largely three products: Carbon Dioxide, which rises up and out though the heat recovery ventilators at the roof; stabilized leachate, which is vacuum-pumped and picked up on a monthly basis and taken to the King County Liquid Waste facility in Carnation, where it is being used in a bird sanctuary; and biosolids, which will be taken to GroCo in Kent, WA, where it is mixed with sawdust and made into fertilizer. It is estimated that it will take as much as two years before the first load of compost leaves the Bullitt Center.